I initially had trouble reconciling the duality of Lapine's portrayal of Cloten: clearly a comic fool as written and Lapine plays him that way, but his unnervingly dangerous behavior toward (a female) Pisanio is not the clown's part. Then I realized that women see this duality all the time. Pointless Theatre, The Dance Loft on 14th, Washington, D.C. Critics have described William Shakespeare’s late-career romance Cymbeline as a fairy tale. Britain's Princess Imogen endures many travails before she finally gets the love of her life (a commoner, of course) while her older brothers, stolen from their nursery 20 years before, are found and take their rightful place on the monarchal succession. All live happily ever after. That’s the guys’ take. In her take, Charlie Marie McGrath contends that Imogen's fairy tale comes before the play begins. Then the men—her father, her stepbrother, her husband, his friend—along with her evil stepmother turn her tale into a nightmare. McGrath's adaptation, which she also directs for Pointless Theatre in Washington, D.C., looks at Cymbeline from a decidedly female perspective, and if you think it violates Shakespeare’s intentions or the play's accepted stage traditions, consider first whether it’s your Shakespearean sensibilities or your XY chromosome combo shaping your thinking. I realized I had to take that into consideration with my assessment of this production, and it wasn’t easy because, you know, I'm a guy. Imogen is Pointless Theatre’s contribution to the Women’s Voices Theater Festival during which 24 theaters in and around the nation’s capital are staging plays written and directed by women. The Women's Voices Theater Festival is intended to highlight the too-often-downplayed role of women in the theater arts and, as McGrath writes in her Imogen program notes, to correct "a deficit, a need, a desperate need to put women's voices at the forefront of 21st century American theater." 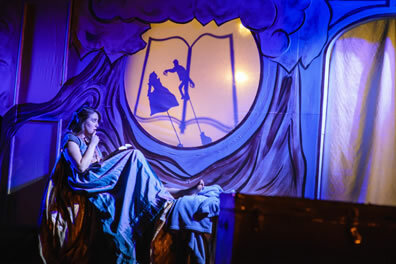 This is also the first Shakespeare outing for the nine-year-old company that specializes in blending live action with shadow puppetry and other graphic design elements, and merging music and movement with script. McGrath, an assistant director for many Shakespeare plays at the Shakespeare Theatre Company in D.C., thought Pointless Theatre’s aesthete would be perfect for her makeover of Cymbeline. That makeover starts with retitling the play. Cymbeline is Imogen’s story. 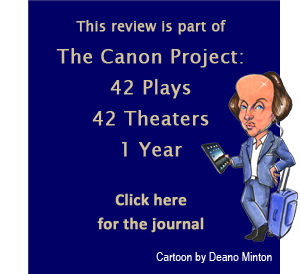 Why Shakespeare titled it after Imogen’s father, the king of Britain, has baffled more than this critic. Cymbeline has a scant 290 lines, just 8 percent of the total in his eponymous play while Imogen's 594 lines are most in the play, according to ShakespeareWords.com. Furthermore, Cymbeline is no more than a puppet manipulated by the Queen, Imogen’s stepmother. And that’s exactly how he is presented in this production: a hand puppet played and spoken by the Queen (Hilary Morrow, switching accents as she switches roles). McGrath mostly relies on Shakespeare’s lines for her version’s dialogue, but she moves many passages around as she cuts characters, she imports some matter from other Shakespeare plays, she does a bit of updating, and she transfers speeches to better fit her feminist intents. Of that list of adaptations, only one bugs me: updating some passages. Example: When Imogen argues that “I chose an eagle [marrying Leonatus Posthumus], and did avoid a puttock [stepbrother Cloten],” McGrath changes puttock to vulture. A puttock is an inferior bird of prey, a kite or buzzard, and also a slang term for ignoble people. If McGrath's edit was intended for a modern audience's better understanding (an assumption of audience intelligence), she actually demeans the meaning, as vultures are so graceful in flight that swans envy them, and they're smarter than eagles. She also upends the rhythm and the aural pun Shakespeare achieves: "putt-TUCK" sounds far funnier than "vulture." Such updating of Shakespeare’s language makes me cringe because it ultimately undermines the impact of Shakespeare's composition for the stage, even for modern audiences. It also undermines the adapter's Shakespearean credibility; it's all about respecting the source, especially important when you start rearranging and reassigning lines for a conceptually thematic purposes. Other than this and similar missteps, McGrath's adaption succeeds as a feminist treatise and insightful rendering of Shakespeare's play. It's a theatrical event, too. Much credit for the theatrical aesthete belongs to Pointless Theatre's co-artistic directors, Patti Kalil and Matt Reckeweg. Kalil is responsible for the set design, a seemingly 2-D backdrop, all white and gold, combining palace and forest settings in a children's fairy tale book drawing. The white treetops double as clouds, and the tree trunks are actually gold fabric that, on closer inspection, form seats and a bed at their base. The palace windows serve as screens where Reckeweg's shadow puppets do their work (supplemented by cast members carrying sheets onto the stage for shadow puppet shows that evolve into live action). Shadow puppets illustrate offstage events: Cloten and Leonatus fighting as the latter heads into banishment, Leonatus sailing to Rome, Imogen and Belarius escaping the court for the woods, and Guiderius, represented as a bear, knocking Cloten's block off, which causes one of the screen bearers to rush off stage as if sickened by the sight. Two musicians sit to one side of the stage, Jonathan Een Newton playing cello and Pointless Theatre Music Director Michael Winch on violin, accordion, percussion, and synthesizer. They keep a steady soundtrack of music and mood, all composed by Winch, throughout the play, never interfering in the actors' lines and sometimes being drawn into the action. Costume Designer Julie Cray Leong dresses the court as a Disney fairy tale, vaguely Renaissance in the ball gowns and brightly colored peasant dresses for the women and tights, vests, and boots for the men. Even the two musicians are dressed in white linen shirts, tan vests, and Renaissance caps. Morrow's queen is outsized in stature as in personality, wearing a tapestry-like hoop skirt the size of a carpet store display window. She looks like the queen of clubs in a deck of cards, black lipstick at the pucker. 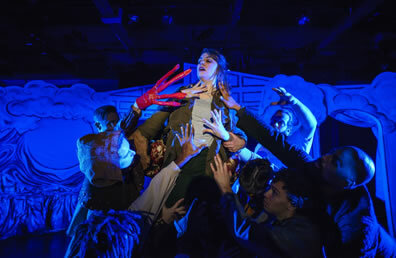 The production shifts into modern dress as Imogen's nightmare progresses. Imogen (Katelyn Manfre) goes from brocaded bodice and flowing dress to gray t-shirt blouse, green pants, blue heels, and brown jacket. Iachimo (Kiernan McGowan), hair ever slicked down, starts out in a greenish-gold Renaissance jacket and a red shirt with such blousy cuffs that his red-gloved hands look like stamen in a carnation; he switches to red pants and leather jacket. Cloten (Maximillan Lapine), a large man with large beard and large hair, both flowing well below his shoulders, is in blue plaid jacket with white lace collar and blousy knee breeches that's displaced by a blue polo shirt and pink and blue plaid Bermuda shorts, his gut hanging over his belt. Even the musicians change into grungy shirts and pants (and no hats) at the intermission. The Queen's look doesn't change, however, and she remains into the final scene (vice Shakespeare having her already dying offstage). When her plots to kill the king and wreak havoc on the court are found out, her dress is escorted off the stage while Morrow, now in all black, remains to continue Cymbeline's performance. Manfre anchors Imogen with a fine performance in the title role, giving the princess a spirited intelligence and a romantic giddiness. The play starts as a court tableaux, with Imogen emerging and moving among the characters until she chooses Leonatus (Alex Turner), and they dance their way through courtship and into a private wedding. Gone is Shakespeare's opening sequence of the two gentlemen gossiping the play's backstory, but its key biographical details are transplanted to other speeches in the play. McGrath reduces the cast to 11, cutting almost all third-tier characters and combining the two Cloten-accompanying lords and the Doctor into one Lord Caseff, played with endearing charm by Mason Catharini. Combining the First and Second Lords, the First constantly flattering Cloten, the Second constantly insulting Cloten in asides to the audience, not only creates a fun two-faced character but results in a wonderful stage device as the First Lord's dialogue pauses, a spot hits Caseff as he delivers a Second Lord joke complete with a bada-boom riff from the musicians, and then the First Lord's dialogue continues with Caseff in flattery mode. Two chief characters are regendered: Pisanio (Acacia Danielson), Leonatus's servant who serves Imogen during her master's banishment, and Belarius (Lee Gerstenhaber) as a mother figure to the lost princes. These gender switches are significant in the production's purposes. Cloten's bullying Pisanio takes on a tone disturbingly relevant to the #MeToo movement. "What villany soe'er I bid thee do, to perform it directly and truly, I would think thee an honest woman," Cloten tells Pisanio with his hand to her throat. Later, when he orders her to bring Leonatus's cloak to his chamber, he puts his fingers on Pisanio's lips as he issues his third command, "That thou wilt be a voluntary mute to my design. Be but duteous, and true preferment shall tender itself to thee." There's no doubting the meaning of this command when spoken to a female Pisanio (Caseff, standing by, intervenes, taking the cloak from Pisanio to deliver to Cloten). I initially had trouble reconciling the duality of Lapine's portrayal of Cloten: clearly a comic fool as written and Lapine plays him that way, but his unnervingly dangerous behavior toward Pisanio is not the clown's part. Then I realized that women see this duality all the time. Gerstenhaber's Belarius has something to say about another set of women's issues dominating current events: children's health care. In Belarius's soliloquy detailing her backstory—how she was a loyal soldier for Cymbeline until the Queen convinced the king to banish her on a false charge of treason, whereupon Belarius kidnapped the king's two sons—Gerstenhaber speaks these lines transferred to her from the gossiping gentlemen of Shakespeare's opening scene: "That a king's children should be so convey'd, so slackly guarded, and the search so slow, that could not trace them!" which Gerstenhaber's Belarius speaks with incensed incredulity, even though she is the kidnapper. "I must aboard tomorrow," Iachimo says, leaning cockily over Imogen. "Oh no," she says with icicle irony. "Yes, I beseech," he responds, clueless to her tone. Ah, but the trunk scene is yet to come, and preceding it, Imogen is reading in bed the tale "where Philomel gave up" as Tereus raped her, a depiction played out in shadow puppetry above Imogen's head, Terius attacking Philomel with elongated fingers. After Imogen falls asleep, Iachimo emerges from the trunk—and he's now wearing red gloves with elongated fingers. He does more than just note her bedchamber, take her bracelet, and inspect her body: he slips those elongated fingers up her nightdress for his own private climax. 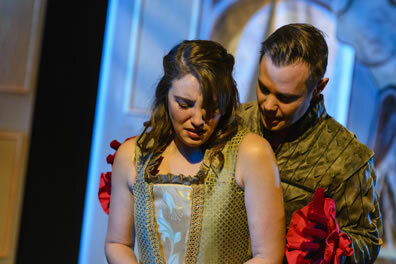 Top, Iachimo (Kiernan McGowan) tries to seduce Imogen (Katelyn Manfre) in Pointless Theatre's production of Imogen. Above, Iachimo's assaulting fingers show up again as the ensemble transforms Imogen into the boy, Fidelis. Photos by DJ Corey Photography, Pointless Theatre. Thankfully, not all the men are bad. She has yet to meet the two lost princes, Guiderius (Renaldo McClinton) and Arviragus (Kevin Thorne II), both exhibiting pure honor and moral character. But, then, they've never lived in society and have learned all their behavior, including their fighting spirit, from their "mother," Belarius. McClinton and Thorne are the acting highlights of a generally competent cast, exuding naive personalities in their line readings and behaving like playful bear cubs: Arviragus even wears a bear knit cap, with tiny cub ears on the skull and ear flaps that extend down the sides, ending as mittens for his hands. Their funeral of the seemingly dead Fidelis is the production's most moving moment as Belarius and sons engage in a mimed cleansing sequence before passing Manfre's lifeless body over and among themselves while Thorne sings a soulful dirge. McClinton has real tears streaming down his cheeks. Choreographer Ryan Sellers gives the actors sumptuously demanding work here and in Imogen's nightmarish transition, but the most clever movement segment comes in the battle between the Britons and Romans. While shadow puppets depict tanks, fighter jets, and soldiers on the move, the ensemble—Britons in black, Romans in camouflage—mime strapping on armor and, locked and loaded, crouching with bent elbows to represent bearing rifles. With Winch and Newton providing a dramatic soundtrack, the actors dance a sequence of formation combat, hand-to-hand fighting, and the rescue of the king by Guiderius, Arviragus, Belarius, and the "poor soldier," Leonatus in disguise. After the battle, McGrath keeps the focus solely on Imogen. Rather than Leonatus dreaming of his family praying over him to Jupiter, Imogen's mother prays over her to the goddess Diana. There is no silly riddling oracle, but the play's final scene remains largely intact, Shakespeare's deftest denouement as he neatly ties up all the various strands of Cymbeline's complex plot with an audacious staging of reveals, reactions, counter-reactions, and further reveals. The play goes off Shakespeare's track and into McGrath's siding when King Cymbeline, channeling King Lear, heads off into retirement leaving the cares of rule to his children. As Iachimo kneels to Leonatus, the latter says the first smart thing he's said all play: "Kneel not to me," and turns the rest of his speech over to Imogen to speak. "The power that I have on you is to spare you," she says; "The malice towards you to forgive you: live, and deal with others better." This inspires her brother, Guiderius, to pardon all the Roman prisoners, whereupon Imogen corrects a great huh? in Cymbeline. In Shakeseare's play, despite having just won the war, Cymbeline's titular king determines to continue paying tribute to Rome (though that's why they fought the war in the first place—another reason Cymbeline doesn't deserve his name on the play). Imogen's titular princess tells Rome's Caius Lucius (Navid Azeez) that Britain won't pay the tribute but will be "a loyal ally" to Rome. Good call. With that, princes and princess, along with her husband and their servants, Pisanio and Caseff, remain on stage, a new generation ready to rule in equipollence. "Never was a war did cease, ere bloody hands were washed, with such a peace," Imogen speaks the plays final line (Cymbeline's in the original). It's a fairy tale ending—though Leonatus is in that tableaux. His XY chromosome combo could play havoc again at any time.